Laura is a second-generation writer of Chinese astrology and Chinese culture. The daughter of Theodora Lau, leading Chinese astrology expert, she has co-authored Best-Loved Chinese Proverbs, the 7th edition of the Handbook of Chinese Horoscopes, and Wedding Feng Shui (HarperCollins, January 2011). 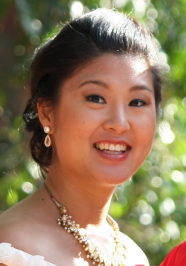 Born in Hong Kong and raised in Southern California, Laura splits her time between Asia and Los Angeles with her husband. Theodora Lau, now deceased, is the author of the bestselling Handbook of Chinese Horoscopes (HarperCollins), Chinese Horoscopes Guide to Relationships (Random House) and Best-Loved Chinese Proverbs (HarperCollins). Theodora's books have been translated into over a dozen languages and have introduced many topics of Chinese culture to readers all over the world. Her daughter, Laura Lau, continues the family tradition of writing about Chinese Horoscopes and culture.